how do you decide which stocks to invest in? When investing (or trading) in shares in any share market, there are many to choose from. In the Australian share market alone, there are more than 2000 equities to choose from - including both companies and ETFs. So how can you decide which of these to invest in? Across all of the available equities, there are a number of different characteristics which might help you to make your decisions. Many investors and traders will firstly compile a list of equities which they will call their own "stock universe". Then they will make a selection from that list based on a variety of other criteria. The important point here is that having compiled a "stock universe" list, they will tend to ignore any equities that are not on the list. By compiling such a list, it will simplify the investment decision process, and help to reduce some of the distractions that can cause confusion. One or more "stock universe" lists - Prepare a list of their own "stock universe". But they might have more than one list, in which case there would be a strategy that describes how to use each list. For example, one list of speculative stocks might be traded with just a small portion of the investment capital, while another list of large-cap blue chip stocks might be used for longer term and more stable investment returns. Separate strategies - Have a strategy that describes exactly how an investment would be made in a stock within the stock universe. Each stock universe would potentially have a separate strategy to guide the investment. WHY bother to prepare a "stock universe" list? It will help you to stay focused on the investing/trading activities. It will be easier to prepare a trading/investing plan to is suitable for a specific stock universe, because the strategy might be a little different for a different stock universe. It will help to avoid distractions. Many investors/traders are happy to read the latest news and announcements about their "favourite" stocks. But if we invest in potentially any stock in the market, then there is too much news to read. By having a stock universe, it will help us to decide which news to read, and which news to skip over. What if I don't prepare a "stock universe" list? It's quite okay if you don't prepare a "stock universe" list. You can still search through the whole market for investing/trading candidates. And you might be distracted by stocks that don't really fit your stock criteria. That's okay. Some people would say that this is not the smartest way to operate. But you will probably end up at about the same end-point. Large-caps - The stocks in a particular large-cap index (eg. in the US market, perhaps the S&P500 index). Mid-caps - A selection of mid-cap stocks. Small cap stocks - Smaller cap stocks (eg. in the US market, the stocks in the Russell 2000 index). Sector specific - The stocks in a particular market sector (eg. Health Care, or Technology), or make a conscious decision to ignore the stocks in a particular market sector (eg. Materials, or Energy sectors). A manual selection of stocks based on market cap - This can be done using appropriate stock selection tools (more notes below). Stock liquidity - You might choose to invest (or trade) only in liquid stocks. That is, the stocks that have enough turn over on the market each day so as to increase your chances of getting into a position, or exiting one, quickly and without moving the market. See a discussion about Stock Liquidity. This topic is also to with Risk and Money Management. The so-called "top 200" stocks - the XJO index (S&P/ASX 200). The so-called "top 500" stocks - the XAO index. The stocks in the mid-cap 50 index (XMD). The stocks in the Small Ordinaries index (S&P/ASX XSO). Many investors think that they would like to invest in blue chips stocks. That is a good aspiration. However, there is no clear definition of the term blue chip, and therefore there is no list of blue chip stocks to work from. See the latest definition of the term blue chip at the ASX website, and note that this definition wording has changed a couple of times since the GFC in 2008. Any broker or financial advisor that has a list of blue chip stocks is using their own criteria to compile the list. In truth, at various stages of the economic cycle, blue chips can disappoint. If you are looking for a definitive list of blue chip stocks, then good luck. These tend to have a market capitalisation in the order of $10 billion or more (subject to change). These are analysed by the research analysts, and recommended by the brokers. Of the 2000+ stocks on the Australian market, only a small number of them are large cap stocks and watched by the research analysts. The conclusions and recommendations of the research analysts do influence the opinions and purchase decisions of many investors. You might choose to consciously follow the crowd and consider their views, or you might decide to avoid these stocks. The Australian XTL index (S&P/ASX 20) comprises just 20 large cap stocks. These tend to have a market capitalisation in the order between about $300 million and about $2 billion (subject to change). The companies that are considered to be small cap stocks, tend not to be watched by research analysts, nor recommended by lots of brokers. You might decide to ignore these, or to follow these stocks. Small cap stocks tend to be less liquid than the larger cap stocks. So be careful about the stock liquidity. These tend to have a market capitalisation in the order between about $1 billion and $5 billion (subject to change). This category comprises stocks that have a market capitalisation in between the large cap category and the small cap category. These stocks tend to be less well followed by analysts and brokers. You might like this idea, or not like it. These tend to have a market capitalisation in the order between about $50 million and about $300 million (subject to change). Micro cap stocks have an even smaller market capitalisation than the small cap stocks, and are often even less liquid than the small cap stocks. These stocks tend to have even smaller share price values, which can be volatile. The share prices of companies (on the Australian market) can vary from as high as $100+ all the way down to less than 1 cent (ie. to fractions of a cent). The stocks with a share price of just a few cents or less are often referred to as the "penny dreadfuls" of the market. The penny dreadfuls do not usually include any blue chip stocks, so some people avoid them. It is true to say that share prices above about $10 are unlikely to double or triple in price, whereas share prices of less than a dollar or so can double in price. You might decide to have one strategy that focuses on low share prices (these stocks can be riskier), as opposed to focusing on the higher priced shares. The notion of stock liquidity is important for a couple of reasons. Hundreds of stocks on the Australian market have very low daily trades, and/or low daily volume or turn-over. Without realising it, many investors eventually exclude illiquid stocks from their stock universe at some stage during the daily or weekly search for stocks. Many investors and traders will filter their list of investment candidates to exclude the stocks with a very low level of liquidity. See more information about stock liquidity. You might have a view that info-tech stocks are likely to have the best candidates at the current point in time. So you might choose to focus on the stocks within the info-tech sector. Likewise, for the healthcare sector, or one of the other sectors. Some investors consider some types of sectors to be "old world" as opposed to "new world". For instance, the technology sector stocks are considered to be companies that are more likely to be more valuable in the long term. This notion is discussed in Nicholas Darvas's book "How I Made $2,000,000 in the Stock Market". Here is one key point to bear in mind about sectors. The sector indexes (eg. XIJ, XHJ, etc.) are only comprised of stocks from the XJO (S&P/ASX 200) index. If you want to know what other stocks across the market are considered to be in the same GICS sector, then you will need to look at a list of stocks grouped by GICS industry group code. See more about the GICS coding system. See more information about the Australian market sectors, including downloadable information sheets. How do the above market indexes relate to each other? Is any one of them included within another? See Robert's Index Composition handout. So how do you actually go about compiling a useful stock universe list? 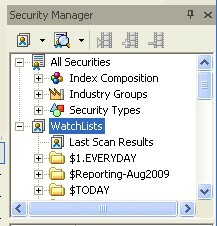 Many investors/traders will maintain a list of their favourite stocks (their stock universe) as one or more watch lists in their computer software - either with their online broker, or in their chosen software package. It is quite alright to have more than one stock universe, depending on your investing strategy. Search tools available with your online broker. Free web-based search tools at various websites. Charting and technical analysis software tools - such as BullCharts. For stocks of a particular range in market cap, use your charting software to do a search* (in BullCharts, one of the 140 supplied scans is in the "Fundamental" category, to scan by Market Cap). To find out the liquidity level of various stocks, firstly understand more about the issues to do with liquidity, and then use a tool* to identify the liquid stocks for inclusion in your universe, or the illiquid stocks to exclude. * - The Australian BullCharts charting software is this author's preferred tool, and can perform these searches. See the links above right for more details. © Copyright 2018, R.B.Brain - Consulting (ABN: 52 791 744 975).